Neill Blomkamp who wrote and directed the Oscar nominated District 9 is back with another dystopia themed film where the space station Elysium is full of “haves” and the ruined earth if filled with “have nots”. Set in the year 2154, the population have been polarized with the rich living in luxury, serviced by robots while the poor and defranchised live in the dry slums of what is left of earth. As District 9 played with the idea of apartheid in South Africa, Elysium is a good companion piece of today's socio-political issues on immigration. Health care and class issues. Matt Damon is bulked up, tattooed and bald as Max, a one time criminal who did his time and just wants to live a somewhat normal life. He works in a factory that makes the robots that service the orbiting Elysium. Max gets his arm broke by a robot cop and he has to explain to his robot parole officer. At work he gets a lethal dose of radiation and given 5 days to live. The only way to survive is to go to Elysium and use on of their medical beds that can cure anything. The trouble is that no one who does not have a Citizen brand can go to the space habitat. 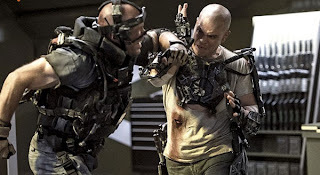 The Security of Defense Delacourt (Jodie Foster) shoots down the ships full of families who have paid Spider (Wagner Moura) for fake ID's to be shuttled to Elysium. This goes against President Patel (Faran Tahir) who wants Delacort to decommission her agent Kruger (Sharlto Copley) for human rights violations. Delacort decides the President is too week and entices John Carlyle (William Fichtner) to write a program that will crash the system so she can take over the government. Meanwhile Max promises he will do anything if Spider can get him on the next shuttle. Spider's plan is to access the brain data from an Elysium citizen and use that intel for his operation and dream of making everyone a citizen. They decide to hit Carlyle and what Max steals puts everyone in danger including his child hood friend Frey (Alice Braga) and her seriously ill daughter. Blomkamp's visuals for this future world is compelling. The Mexico City dump stood in for the sprawling Los Angeles area. Elysium was fashioned after Rodeo Drive in Hollywood. Even the people that work in Delacort's control room wear clothes fit for a nice cocktail hour at a fancy hotel. Foster's Delacort is almost robot like in her unemotional single mindedness. Her accents seems to fluctuate distractedly from scene to scene also. To save her secret coup plans, Foster reactivates Kruger who goes after Max who must go to Elysium and reset the citizen mode before Foster takes control of Elysium. Matt is like Bourne with robot implants and Copley's Kruger is so evil he should have a handlebar mustache to twirl. The action is fast paced and the final battle scene if pretty exciting with ships crashing, soldiers running around and the ultimate confrontation between the mechanically enhanced humans. While that whole thing with the poor vs the rich theme in future has been done to death. But Blomkamp gives it a fresh perspective with some higher quality actors with a bigger budget.